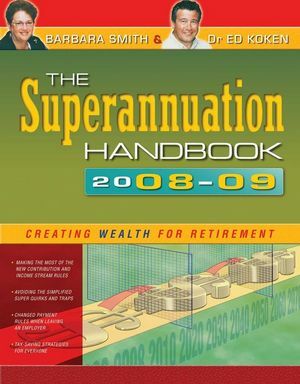 Each year The Superannuation Handbook is fully revised and updated to reflect the many changes to superannuation rules, the ways you can save for retirement and the best way to eventually access your savings without it costing you thousands in fees. It includes information on the myriad changes that have been recently proposed and come into effect after July 1, including the changes that effect self-managed superannuation funds and small business owners. The authors are tax, superannuation and self managed superannuation fund specialists. Barbara Smith AM, CPA (Taxation), CFP, FTIA, MTax, Mbus, Bed, Dip Financial Planning is a leading authority on superannuation and retirement planning in Australia.